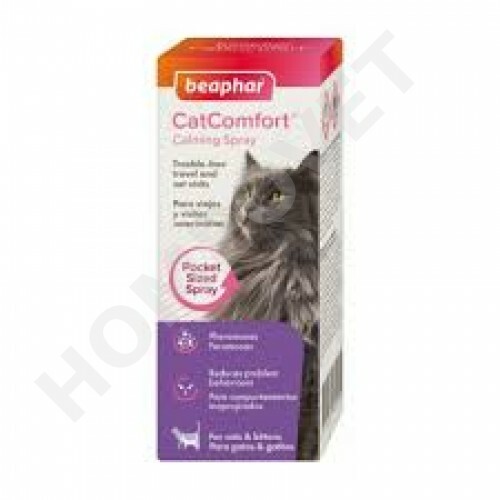 Beaphar CatComfort® Calming Spray is a simple and effective solution to reducing problem behaviour in cats, such as inappropriate scratching and urination, or general feelings of anxiety. This handy spray is perfect for use anywhere around the home, and can be sprayed directly onto your cat's bedding, helping them feel settled and preventing destructive behaviour. Beaphar CatComfort® contains a copy of the naturally produced cat facial pheromone, which gives a reassuring message to let cats know that this a safe area for them to be in. Ideal for everyday use, during events such as fireworks or parties, and is especially useful in cat carriers during stressful travel or trips to the vet or cattery. Each application lasts for up to 5 hours.